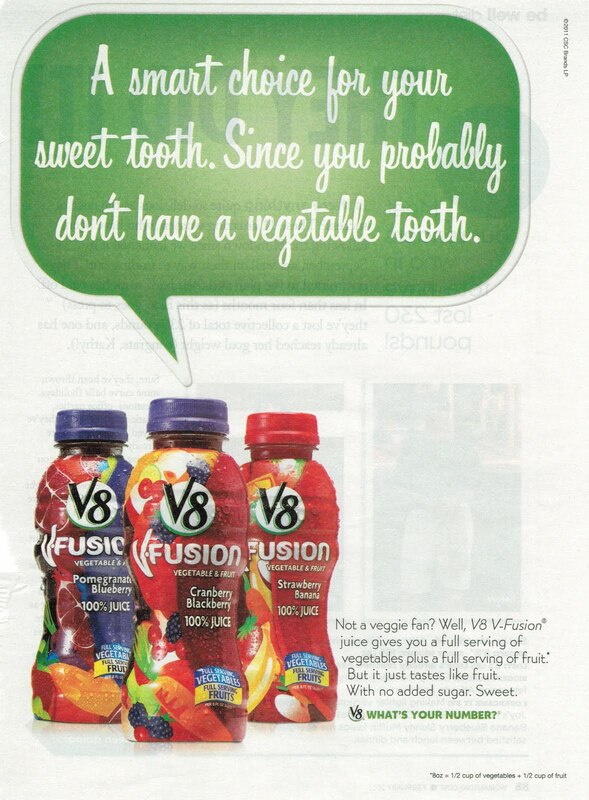 Weighty Matters: Badvertising: V8 V-Fusion tries to fuse your brain cells. Badvertising: V8 V-Fusion tries to fuse your brain cells. You're really trying to suggest that that V8 V-Fusion with 120 calories and more than 6 teaspoons of sugar and 0g of fibre per glass along with a bunch of Vitamin C is the equivalent of eating a half a cup of broccoli and half a cup of blackberries? That half cup of both broccoli and blackberries? Well together they'd contain only 46 calories, and they'd also contain 5g of fibre and only 1 teaspoon of sugar. They'd also contain all of the phytonutrients lost during juice processing and their sheer volume will help make you feel full. You can't drink your fruit and vegetables!